The community of Newton, Massachusetts, is up-in-arms over a biased, anti-Israel teaching that is being promoted in local public schools. On Monday night, parents expressed their outrage at a Newton Public School board meeting, bringing the controversy to the forefront. They cited textbooks that resemble propaganda, events that push pro-Palestine sentiments and movies being shown that they claim are anti-Semitic. The predominantly Jewish Boston suburb has been fighting the school system for the past five years for what they view as a blatantly anti-Israel agenda. 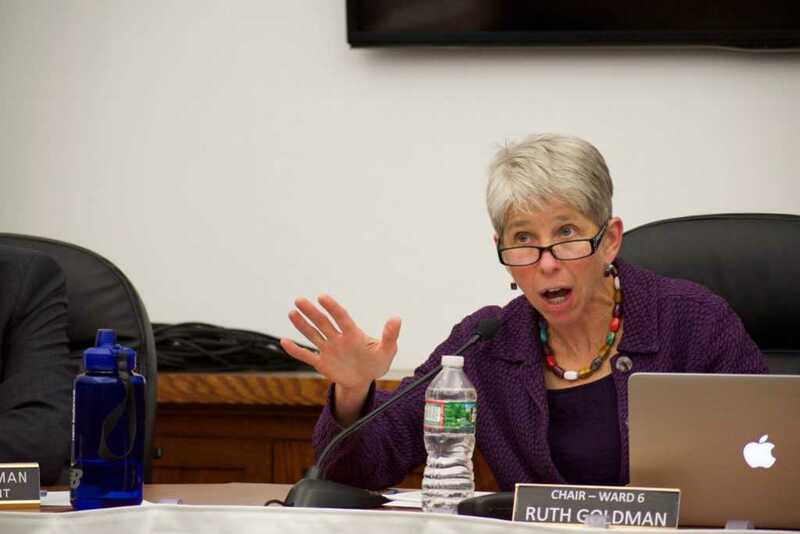 Seventy people showed up to the meeting on Monday, waving signs that said “Fire [Superintendent David] Fleishman!” and “Replace [Committee Chair Ruth] Goldman!” More than 15 people signed up to testify against the school, but Ruth Goldman, the Chair of the Committee, only allowed seven to speak. One of the main advocates in attendance was Charles Jacobs, the President of Americans for Peace and Tolerance. He pointed out that Newton Mayor Ruthanne Fuller had promised that she would require the schools to be more “transparent” in what they were teaching, which she has not done. Parents called for transparency after they found out their children were being taught from the Arab World Studies Notebook, which includes a variety of false statements, including that Israeli prisons torture and murder of Arab women. Superintendent David Fleishman also promised those within the Newton Jewish community that he would remove all teachings on the Middle East because the material they were using was not scholarly. Jacobs accused Fleishman of breaking his promise, stating that the school was still preaching pro-Arab and anti-Israel sentiments. Parental outrage reached a high this past May when Newton North High School celebrated Middle East Day and the school put on a movie showing that depicted Jews falsely and unfavorably. One movies shown called “Ismail,” depicts scenes similar to “Schindler’s List,” but instead of Nazi’s exterminating the Jews, it shows Jewish soldiers exterminating Palestinians. According to Americans for Peace and Tolerance, the film is propaganda put on by Electronic Intifada, journalist Ali Abunimah’s non-profit group. The outrage over the May 2 Middle East Day was so intense that even the Jewish Community Relations Council (JCRC), a typically liberal group, protested the event. After six years of denying a bias being pushed in the school system, the organization finally snapped and sent a letter to Superintendent Fleishman, calling for transparency of what took place on the May 2 event. “The focus of the concerns regards the content presented, including the film that was screened, whether students were provided with different perspectives, and the sources and sponsors of the content,” the group wrote. In addition to parents, community members have also expressed their concerns. Einstein stood smiling, facing both Fleishman and Ruth Goldman when she called for both of them to be fired. Tom Mountain, who is the Chairman of the Newton Republican Committee and father of a student in the Newton school system, also stood up and called for the firing of Superintendent Fleishman. He asked the committee how a Jew could allow for so many Jewish students to be taught anti-Israel, pro-Palestine propaganda. Protesters have not been given any notice in previous committee meetings, as they are ignored by both Fleishman and Goldman. This meeting was no different. When the seventh allocated speaker finished, Goldman did not comment and moved on to the next topic. Many groups and individuals are planning on trying to get the School Committee to agree to have a meeting entirely directed at discussing the anti-semitism they believe is plaguing the school system.